Thanks to introduction of the PCIe-based M.2 form-factor and subsequent removal of SATA III bandwidth constraints, the evolution of high-performance SSDs has been quite spectacular in the recent years. Nonetheless, there are plenty of SSDs which still rely on SATA and will continue to use SATA. Such devices can be used to upgrade previous-generation PCs or inside new low-cost notebooks. To address this market, Samsung has revealed that they are working on their all-new Maia controller and SSD platform for SATA, laying out how they intend to continue to evolve SATA SSDs. The new Samsung Maia controller supports multiple types of NAND flash memory, including TLC and 3D NAND/V-NAND. At the Samsung SSD Forum Japan, the company demonstrated two new SSDs based on the Maia chip. Both drives come in 2.5” form-factor and with a SATA III (6Gbps) interface. Initially Samsung intends to use the controller to build drives for OEMs, but as is often the case with Samsung, it is quite possible that it will eventually show up in retail SSDs as well. The new Samsung CM871a OEM SSD based on the Maia controller will feature Samsung’s 16nm TLC NAND, which indicates that the company has no plans to drop production of planar NAND flash memory for consumer SSDs any time soon. The drive is rated for maximum sequential read speed of up to 535 MB/s as well as sequential write speed of up to 215 MB/s in default mode or up to 515 MB/s with TurboWrite technology active. Like many modern TLC NAND-based SSDs, the CM871a uses part of the non-volatile memory in SLC mode for rapid caching. The SSDs can perform up to 97K random read IOPS as well as up to 59K random write IOPS (or 88K IOPS with TurboWrite technology). Samsung will offer its CM871a in 128 GB and 256 GB configurations, which indicates that the family was designed for the low end of the market. Meanwhile the Samsung PM871a will use the Maia controller alongside TLC V-NAND memory. According to Samsung, the drive has maximum sequential read speed of up to 530 MB/s and maximum sequential write speed of up to 515 MB/s (or up to 526 MB/s with TurboWrite). Random read performance of the PM871a is up to 97K, whereas random write performance of the drive is up to 88K IOPS. Samsung plans to offer its PM871a SSDs in 128 GB, 256 GB, 512 GB and 1 TB configurations. Samsung does not specify whether it utilizes its third-generation 48-layer V-NAND memory for the drives, or some drives continue to use previous-gen memory. While usage of 256 Gb TLC V-NAND for high-capacity SSDs makes a great sense, a 128 GB drive would in this case require only four such memory dies, limiting parallelism and is a solid example as to why manufacturers have been hesitant to produce small drives with cutting-edge high-density NAND. 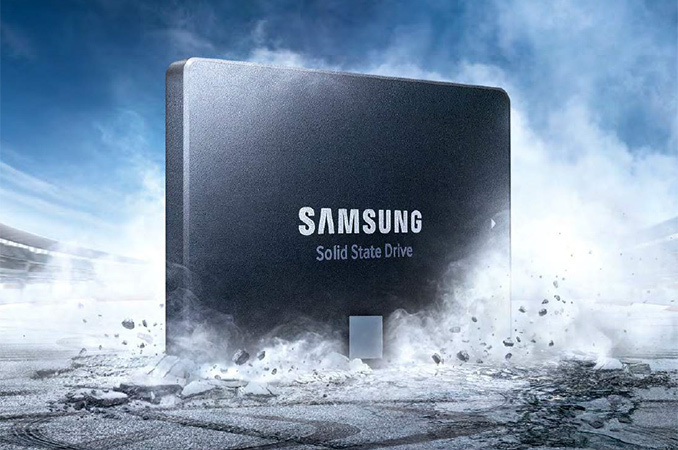 These drives would be replacing Samsung's exisitng product line such as the PM871, which we have limited information about (given slow writes, it is logical to assume that it uses TLC NAND, but that is not something confirmed by Samsung). Meanwhile in the retail channel Samsung sells the inexpensive 850 EVO and 750 EVO SSDs. These SSDs are based on the company’s MGX controller, coupled with the company's second-gen 32-layer TLC V-NAND or 16 nm planar TLC, respectively. The aforementioned drives offer performance levels very similar to those of the forthcoming CM871a and PM871a, which may indicate that Samsung’s new Maia platform focuses mostly on cost efficiency, endurance and predictable performance, but not on maximum sequential read or random IOPS numbers (especially given limitations of SATA). Nonetheless, the development of Maia shows that SATA is still an important part of the market for Samsung as lower-end PCs continue to rely on it. i want SSD´s for DATA storage (for my photo collection etc.). big SSD´s that doesn´t cost a leg and an arm. i have a fast M.2 SSD for the OS but i want silent SSD´s with 2-4TB, with good access times. they don´t need to be high performance. but i want to get rid of vibrating hardrives... i am sick of big 5.25 inch vibe fixers. small 4TB 2.5 inch drives in sharkoon mounting frames.... that´s my dream. I completely agree. Companies are still trying to release blinding speed sata3 drive when msata blows it out of the water. Most sata3 drives will "feel" the same in daily tasks. I assume the "feel" of sata3 and msata is also very similar, but i havent used an msata drive yet.